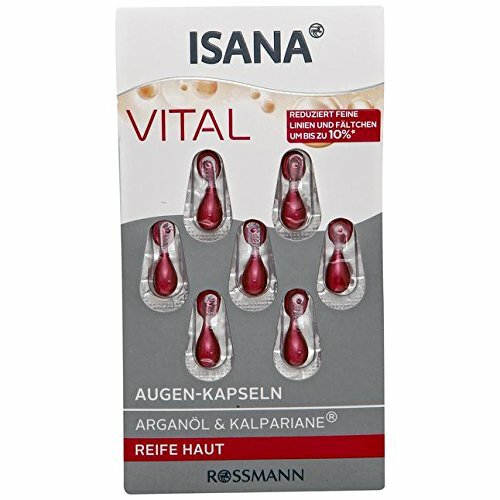 ISANA Vital Eye Capsules: Rival de Loop eye capsules reduce fine lines and wrinkles in the eyes when used regularly. ** The precious eye area is revitalized and maintained with precious argan oil and Kalpariane. Effect: Precious argan oil and squalane preserve the skin's moisture and support the skin barrier. Kalpariane, the algae extract from Brittany, stimulates collagen and hyaluronic synthesis *. Vitamin E protects your skin against light-induced skin aging. Result: The depth of the eye patches is demonstrably reduced. ** The eye part has a more youthful and fresher appearance. If you have any questions about this product by ISANA, contact us by completing and submitting the form below. If you are looking for a specif part number, please include it with your message.